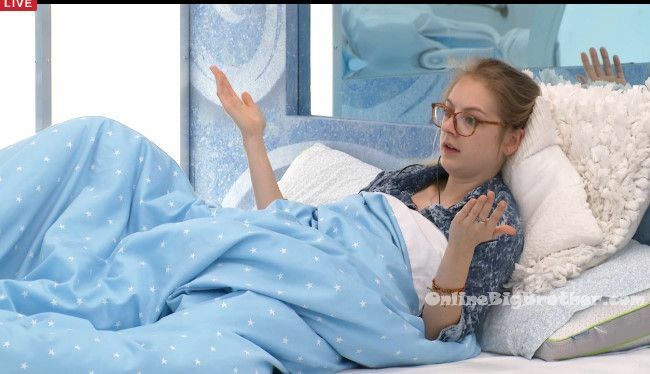 Sarah "We ain't playing for fifth place, we're not playing for third place either.. eat that sh*t"
9:30am Big Brother wakes up the house guests. Bobby, Bruno, Zach, and Pili are in the kitchen. Sarah says sure we keep Bobby now and maybe he helps us get people out but then he kills us in competitions. I didn’t come here to play for third or second place. Sarah asks you can only win 1 week at a time. Not to mention what have you done for me lately bro!? Godfrey says he got Sindy out, he throws competitions, he lied about the secret veto. Sarah says I trust you more than him. Sarah says we don’t have to put all our eggs in the Bobby basket. Sarah says when they get really intense is at the end when we would be f**ked at the end against him, not them. Bobby might get us one more week. I’m looking long term. I’m not looking for one more week. Godfrey says I’m going to keep Britt Yo! She’s a way more independent thinker. She’s not going to flip. Sarah says everyone is trying to go to the end with Ash and Pili .. because think about it what have they done. Godfrey says but that’s dangerous .. better to go with people you trust. 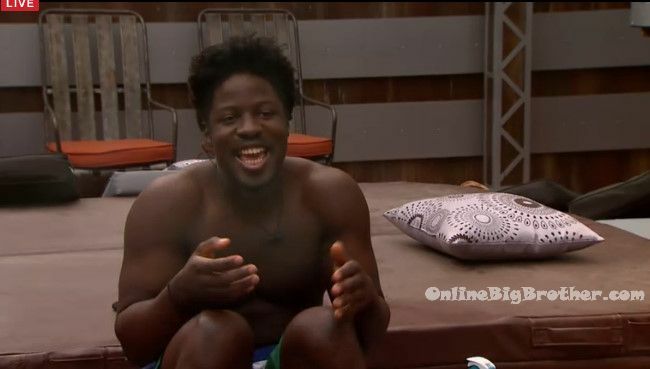 Godfrey says right after Kevin didn’t nominate me the two Goblins came up to me and said hey we got your back! Godfrey says yeah just like the two votes you cast against me last week. Sarah says that’s hilarious. Godfrey leaves. Sarah talks to Brittnee and tells her about the conversation she had with Bruno last night. He was almost yelling at me. He says we’re all next if Bobby goes. Sarah says no you’re next. Britt says exactly. Sarah says we ain’t playing for fifth place.. we’re not playing for third place either.. eat that sh*t.
10am – 10:35am Bruno and Bobby head out to tan in the hot tub room. Bruno talks about Zach and says that he’s full of sh*t. He was sitting there telling me he’s going after Sarah and Britt. Bobby talks about piece of a coat hanger he pulled out in the veto ceremony and says after he was joking maybe he could sell it on ebay for 10K .. the 10K he should have gotten if he had pressed that button in the vault. Zach and Godfrey join them. They all suntan in silence. Willow, Ash and Pili join them. 10:40am – 11am Kevin joins Sarah and Britt in the bedroom. Sarah tells him about the conversation she had with Bruno last night. Kevin laughs and leaves with Britt. Sarah asks Willow to come here right now. I swear to god I will self evict if you keep acting like this. Sarah says we already have to act distant in front of other people can’t we just act real if we have 2 minutes alone together. Willow says I have to do it all the time to keep it up. Sarah says can you not just say you love me? Sarah gets upset and crawls under the covers. She says she can’t do this. Willow comforts her. Big Brother tells them the house is off limits. Sarah asks task!?! 11am – 11:35am Hot tub – Bobby, Britt, Bruno and Godfrey are hanging out chatting about random things. Godfrey talks about eating goat eyes and says they’re the shape of hershey kisses. Bruno asks what else do you eat that’s gross. Godfrey says goat head and brain. “Brain spread” Brittnee is disgusted by the conversation. Godfrey says that the tongue is the best part. People would fight for it. It tastes like ham. 11:40am – 11:50am Brittnee, Sarah and Bobby are in the kitchen. Britt tells Bobby in a couple days we won’t see each other. ..well not for awhile. Bobby talks about how he still thinks winning the first HOH was a curse. He says that he wants to keep his pride. Its a very relaxing feeling to not be talking game. Big Brother tells the house guests the backyard is now off limits. All the house guests head inside. 11:55am 12:05pm Up in the HOH room – Kevin, Ash and Pilar are talking. Pili says its obvious that Bruno is lying. Ash says everyone is coming and talking to each other and he’s telling everyone different things. Kevin tells them about how Bruno pulled Sarah out by the pool late last night. They talk about how its perfect Bruno, B and Sarah are pissed at each other. Ash says the more heat that they have .. the cooler we are. I want to win this next HOH so bad. I need it. He is trying so hard to scramble and he’s going about it all the wrong way. Kevin says even if Godfrey wins you would probably be able to survive. Ash says for me right now Sarah is not a threat to me but I want to look out for you guys too. Kevin says even if Sarah wins we might be okay. Ash heads down stairs. 12:05pm – 12:25pm Big Brother tells the house guests again that the house is off limits. All the house guests head back out into the backyard. They talk about the road trip they want to take from Seattle to Vegas. Sarah says we have to get a big bag so we don’t have to mess with it the rest of the trip. Sarah says I’m contacting Dr. Will and telling him we’re coming. 12:30pm Big Brother blocks the feeds. My head is spinning with all the lies that Sarah spews unnecessarily. I watched the discussion with Bruno last night, and although not my favorite player, he certainly didn’t yell at her. I just don’t get why she constantly lies to everybody. He tried to make a point yes, but so did she. No yelling. Is she trying to get him out? Does she want the Diapers to win this? I don’t get this whole thing. Why isn’t she trying to keep their little group together instead of talking bad about the people that can keep her in the game longer. It’s the same thing that Bruno is doing to Sarah, they can’t actually throw anyone else under the bus anymore to further themselves. The four couples are strong and what you say to one of them is being relayed to their entire whole group so the only way to defend themselves is to shift the target to another person. She basically is villifying Bruno to make his target bigger. This also makes it look like Bruno is trying everything to upset the votes and go after the couples. Apart from that this also make it look like she is coming after Bruno, which is actually why the diapers are feeling safe that even if Sarah/Brit wins HOH they will still have the numbers to keep a diaper member safe. 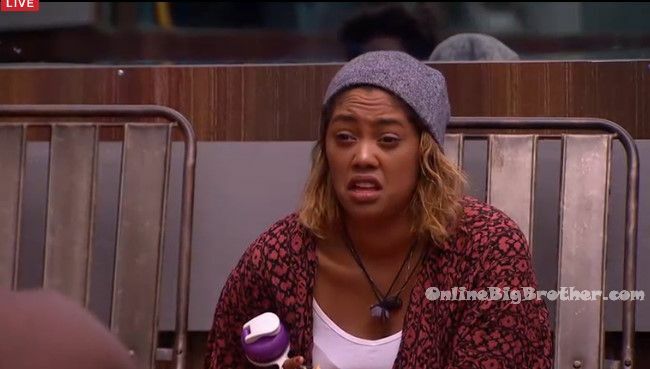 Bruno has been the one spewing lies since POV ceremony..
Not everyone who dislikes Sarah or her gameplay is a mysoginist/woman hater. I guess you need to resort to extreme and hateful language because you don’t have really have a convincing argument or rebuttal, that and you clearly don’t have any confidence in your own opinions to stand alone without resorting to stereotypes and hate. LOL. The “unnecessarily” lies that Sarah just spewed just saves her another two weeks from the diapers few hours after she told Kevin. If you listen to the diapers meeting they are targeting Bruno and Godfrey next week. And even if she gets put up in the triple eviction this Wednesday when one of the diapers win HOH, she could end up staying. I watched that conversation too and i didn’t hear Bruno yelling at her at all.He did make a cogent case from HER perspective and it’s up to her whether she goes with the plan or not, but she shouldn’t have spilled the beans to the others.All her “all girls alliance BS” she hangs on even in the 7th week will be her demise.She does deserve to get booted out while sitting just beside her best friend Brittnee. I respect Sarah bad-mouthing everyone as a strategy to let her interlocutor know “I’d never work with that guy”, but I’m just irritated by what I’d call going way overboard with it. She said “he was almost yelling at me. he was being a bully”. I’m really sick of people using the bully card that much, and that applies to both HGs and people commenting on this forum. Sarah made fun of Bruno for having arguments to save Bobby that were contradicting themselves. She’s right, but she’s just as contradictory when she says “girl power!” and then paints herself as this weak little girl who got bullied by Bruno. How dare you criticize Sarah and make a valid point?? You must be a mysogynistic, chauvanistic woman-hater. You have the audacity to criticize Sarah’s lies. You should apologize to ALL women right now. look how dan gheesling played see how many lies cameouty his mouth! You’d probably like frog legs and escargots if you gave it an honest try – they actually taste great! I hope Bru takes out the poison pill / crybaby / nanny state handout seeking pot head that is Sarah. Her hypocrisy is unbearable! If you want power earn it! If you want respect earn it! Stop crying about how unfair life is and how the other side doesnt deserve anything because they are rich, spoiled and entitled. Sarah, the weed has your mind twisted and your victim mentality is transparent. Bru is going to send you back to stonerville! first off I thumbs down your uneducated comment … read the latest study on the effects of weed before making a very such comments. Second , you leave me wondering what vice you take that has left a few of your brain cells dead…lol.. ouch huh … only saying educate yourself before making uneducated and I might add discusting comments… THUMBS DOWN .. I just do not understand why people like Sarah. All she does is cry because she has no power and talk horrible crap about who does. Its not their fault that she can’t win anything!!! But yet when B was HOH, she walked around like her Sh@& didn’t stink. And now she criticizes people for acting just as she did. And she condemns the Diapers for being together but yet she has her pose’. Something!! What a hypocrite. I hope to God that she gets evicted on Wed. Please! Make my day!! Perhaps you don’t understand the game. Oh, I understand it VERY well. She’s a weak girl who cry’s her way through life. She says she’s so independent and strong, when? Where? She can’t even get through a day without Willow saying “I Love You” or she starts freaking out. And she hasn’t won crap. She’s a horrible player and its time to go. Even Willow is a better player than Sarah and Willow is a Andy Rat Clone. My comment was not ridiculous. I was asking a question, that’s all. I have no horse in this race, just trying to understand what her reasoning was…..no more, no less. Obviously you cannot stand anyone questioning what she is doing. I thought this is where we come to comment and question moves in the game. Sorry if I sounded like your beloved Sarah was doing something wrong….that wasn’t my intent. Don’t let it get to you. There are some really questionable people on the internet. You getting affected by their mean spirited comments might just be the only highlight of their day. Don’t give them that pleasure – they certainly don’t deserve it. I concurr ! Sarah for some reason thinks the game should be give to her…win something then and don’t cry if you dont! Get rid of that man-eating wall you got built and think for 1 second about aligning with a male or two….get rid of Britnee who is only keeping you down. Bruno’s conversation with bobby about Zach being a liar in saying he’d go after britt and sarah shows one thing: Zach isn’t the only person that is misreading what is going on around him. Bruno fails to see that Zach’s entire method of attack is to never directly target physically strong competitors. He wants other people to do that so that the physically strong will target someone other than him. (its too soon for a big move./ if you take the shot first, i’ll come in later and wipe up the rest, later.) Zach would most likely go after sarah and britt, even before godfrey that has blatantly targeted him for eviction. less risk of successful counter attack reprisal in his mind. he would prefer if one of his allies nominate the other comp physical threats. Bruno has talked strategy with Zach before. he should have realized this. Wow are they going to be BIG TIME SHOCK…when they hear Arissa say TRIPLE! I can’t wait to see their faces. It’s so ridiculous to me that Sarah and Bruno don’t realize how much they need eachother in this game. If they would just shut up and stay loyal to eachother they could go further. Instead they’re feeding a 4 person, solid alliance information to further THEIR game. It’s really frustrating. Sarah keeps holding it against Bruno for putting her up … ages ago instead of getting over it especially now when the numbers have been dwindling down. And , it’s true, Bruno’s “Sarah is poison” thing should stop and both of them should reconcile and play mindfully from now on. Bruno and Sarah have their own trusted ally on the block together. It only makes sense that two of the strongest social players are going to do whatever to keep their respective ally. So we should give them room to do that.Each does need to be cautious regarding bridges burned during this spar off. And the more I think about Kevin’s strategy to keep noms the same the more I am convinced it was his smarter choice. He still is not fully certain that the other side (Bruno/Sarah) are not working together. This puts a wedge in there and he can see how the different players scramble. Kevin is getting more information out of this week than if both Bobby and Bruno were up together. Kev’s still not as safe as he hopes though. Voting out Bobby is the big mistake on Sara’s part. On Sara’s side, there is no one is good at endurance comp, puzzle comp and physical comp. After Bobby goes, they will be picked off one by one. I do not understand why Sara concerns so much about by keeping Bobby will make Bruno’s side stronger. Does Sara think by voting out Bobby will make other side stronger? Kevin is playing with Sara to push for Bobby to go, does she see that? Does Sara see the other side is afraid of Bobby? I do not know how is Britt good for Sara’s game. Even Britt stays, when Sara is on the block, she does not have the vote to stay. Willow, Britt will likely vote with the house. At this point, Sara needs someone to win comp, not someone she needs to carry to final 2. Sara and Britt will not win comp back to back to get to final 2. Does Sara see that? Sara is playing emotional not logical right now. Even Derrick knows Caleb is a threat, but he still keeps Caleb to help him further his game. I can see the other side will win this season. Great post! I would give you more than a thumb up, but it’s not possible. What if Sarah goes up beside her shield and goes home in F6 or even earlier? Maybe Sarah would be better off as a pawn herself than sitting beside B. Either way, Sarah, Brittnee and Willow don’t seem to win comps for themselves and, no matter who they align themselves with (Diapers or the guys), all of them are bound to go home sooner or latter. Derrick didn’t win any comp last year, but his social game was way better than Sarah’s just for the fact that he was good with everybody, whereas Sarah is not. Her odds go up as people go out. And she is right, the really physical comps tend to come later. Difference to Derrick/Caleb: Caleb legitimately wanted to take Derrick to F2 (as did many people!). Sarah knows Bobby wouldn’t. As a matter of fact, she must fear that Bobby might have some remnant Chop Shop loyalty to Ash and Zach. Bobby is part of a solid double with Bruno, so since she can’t evict a diaper right now, she might as well break that couple up. Also, if Brit was evicted, she’d become the most likely new eternal pawn in the future. So you rather see sara’s side keeps losing comp and with Britt as pawn until they are picked off one by one or you rather see sara’s side wins comp and no one needs to be pawn. IF Bobby for sure WAS on Sarah’s side, I’d agree with you. But they just voted together once out of necessity, and they don’t trust each other one bit. Sarah’s game is to be with whoever is in power as much as possible. She’s fine with a strong guy getting evicted, since she can sense that it might be her best shot to wait for a crack in the diapers (sorry for that image in your head!) while week for week, strong players are going to get evicted. She’s all talk when telling us what a strong player she is, but she’s happy to keep on floating on for being considered a waste of an HOH. If Sara, Bruno, Godfrey or Britt do not win the next HOH on Wed, I think I will be done with this season. Because after the triple eviction HOH is the endurance HOH. Sara, Bruno, Godfrey or Britt needs miracle after bobby is evicted. I really want Sara wins the next HOH so badly, just to see how Kevin’s cockiness drops when he is on the block. find it funny every1 bashing sarah lies but isnt it how to win the game!well i gues kevin lies working to aka the poker player! Bruno a woman hater?!?! Haha, not at all. Sarah’s gameplay is poison for his for sure. She is playing a similar game to his. If Kevin is left in the game too long he will win it. More like Sarah man hater no? House off limits could mean planting of clues for the Red Veto.